Love how all the Custom Earth Promos products are eco-friendly. That's just one of many bonuses of using this company. I highly recommend you checking them out. The perfect item to showcase at our upcoming convention. Very fashionable bag for an affordable bulk sale price. Very fashionable recycled small bamboo grocery bag. They were a big time hit at my most recent convention. Thank you CEP this is exactly what I needed. Perfect fit. Top tier company. This fashionable bag was a great promotional resource to help grow my business. The logo came out perfectly as expected. These were the perfect addition to our bread and breakfast. Great marketing and useful to all our guests. Being that they are eco-friendly only solidifies my purchase. Awesome concept for eco-friendly bags! Love the bamboo material! Such sturdy bags that I use for everything. I'm an admit shopper and they make life so much easier. Love them! Great quality product 5 Stars! Justifiably one of the best eco-friendly bags I have bought in the market. Great customer service. Really went above and beyond to help me fill my order. These were some of the coolest earth-friendly bags I have ever seen. I wanted an item that was light weight, yet durable and it also had to look great. I found all these in this one earth-friendly bamboo bag. All my co-workers were very impressed with it. I loved the idea of these earth-friendly bags being made out of bamboo. I know how durable and strong bamboo is, so putting my stock in these bags was a no brainer. The look and feel of the eco-friendly small grocery bags really was a plus. Usually I stick with a certain bag when ordering, but I really liked the look of this bamboo bag. I had Ashley send me a couple samples. Once i got them I fell in love with them. I placed an order for 5,000 on sight. Needed 7500 of the customized small grocery bags for my farm stand. I love the look and ability to personalize the bags, just to my specifications. I couldn't believe how indestructible these bamboo bags were. We needed something like these for all our clients at IGHL. Nice that we were able to customize them too. Light weight and durable. Nice!! Perfect bag for our carnival. We had our logo printed on the front. They came out awesome. Customized 6,000 of these eco-friendly bags for all our students. Received our order in a matter of weeks. Great idea for any teacher. With a tensile strength higher than steel and rate of growth that exceeds that of any other foliage, bamboo is one of the most fascinating eco-friendly materials we work with here at Custom Earth Promos. Bamboo grows without the need for chemical intervention thanks to its natural antifungal and antibacterial properties. Without the need for fertilizers of pesticides, we take great pride in knowing that Custom Bamboo Small Grocery Bags have not been exposed to potentially dangerous additives. Bamboo bags are soft and luxurious to the touch, adding to their eco-friendly charm. Promote your business while broadcasting your brand investment in planetary preservation, benefiting your brand image for years to come. 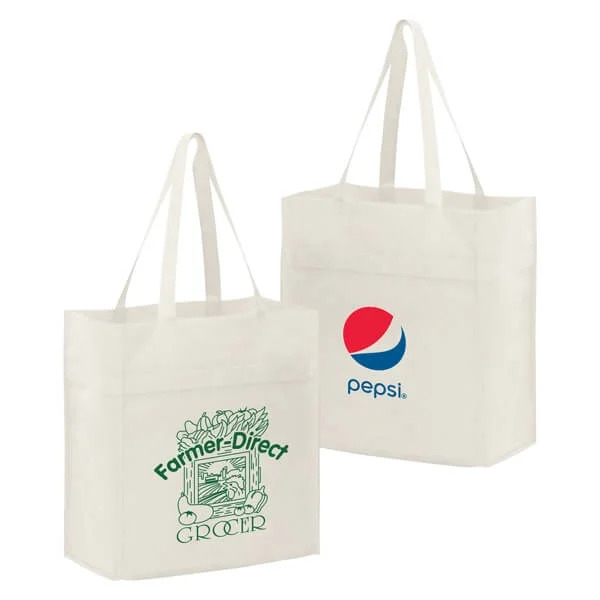 Unlike all other promotional products here at Custom Earth Promos, Custom Bamboo Small Grocery Bags are only available via direct order from overseas. The quantity ordered must meet or exceed 1,000 items. Our production team provides rush service for your small bamboo grocery bag order, with guaranteed delivery just 30-45 days following the confirmation of your blueprint. You'll soon have a high performance, economically and environmentally friendly promotional product, ready to supercharge your marketing efforts and solidify the environmental consciousness of your brand. Are you interested in gaining the loyalty of your existing customers while attracting potential customers? Look no further than these budget-friendly, biobased bags. Eco-friendly promotional giveaways are a spectacular way to build your consumer base while adding value to your brand image. Use these bags as loyalty incentives, prizes or promotional giveaways. Their combination of stylish design and environmental consciousness will win the admiration of customers, employees, and professional connections. This fosters brand loyalty from customers who appreciate your eco-friendly efforts, also increasing the potential for word of mouth advertising each time they wear your custom bamboo bag. Your business, charity or cause is guaranteed increased exposure every time these bags are worn, attracting new prospects while establishing an environmentally responsible and ethical brand image. Promote a specific product, upcoming event or simply boost brand recognition with a simple display of your company logo. With endless customization options, wholesale bamboo bags make an excellent and effective marketing tool for customers in retail, hospitality, healthcare, spa, beauty and luxury industries. Custom Earth Promos' small bamboo grocery bags are increasingly popular among eco-conscious companies. Brands interested in establishing themselves as planet-friendly and eco-aware can gain such attributes with the use of this naturally derived promotional product. Our bags are crafted from 100% biodegradable natural bamboo, ensuring their safety for both the environment and your customers. Bamboo grows rapidly without the need for fertilizers or pesticides, so the material used is free of any potentially dangerous chemicals. While the material is extremely sturdy it is also soft and long-lasting, which allows effortless and easy maintenance. The bags come in a convenient size of 13" W x 14" H that can be used to carry multiple items. A 7" depth provided by the gusset is an added advantage, as bulky items can be carried without any damages. Each Custom Bamboo Small Grocery Bag is fitted with a recycled plastic bottom board insert, which provides extra support for carrying heavy items. The 22" long carry handles of the bags can be easily adjusted for better carrying comfort. Optimize brand exposure with a custom graphic display within the available 8" W x 8" H imprint area. Choose from a wide range of pre-designed graphics and stock images or customize the imprint on your order to optimize the exposure of your brand. Customize your graphic to publicize a product, company milestone or corporate convention. Our high-quality printing equipment ensures that your brand name and logo are noticed everywhere these bags go. In an effort to safeguard the health and welfare of your valued customers, Custom Earth Promos puts every product through stringent testing before it is able to leave the facility. Compliant with California's Proposition 65, all products are carefully tested and guaranteed free of any hazardous contaminants such as lead or cadmium. You can rest assured in the safety of your customers are confident in doing your part to better the planet for future generations! Custom Bamboo Small Grocery Bags from Custom Earth Promos are available for bulk and rush orders. Our overseas production facility specializes in producing large quantity orders within record time. Each order is skillfully crafted according to the unique specifications and design requirements of the client, guaranteeing impressive results and high-quality products. Add an imprint of your company name and logo or choose to add a custom design that promotes a particular product, event or special messages. Imprints can be customized to suit approaching marketing ventures or enhance current ad campaigns. Work side-by-side with our design team to explore available options like piping accents, custom color stitching, dimension alterations, edge-to-edge printing, embroidery and material density alterations.